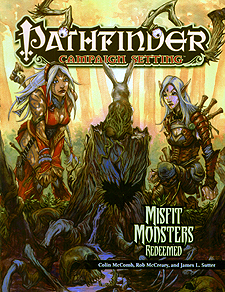 With Misfit Monsters Redeemed, Paizo Publishing has taken 10 of the most notoriously bad monsters in RPG history - the lamest, most hated, and flat-out silliest creatures in the genre - and attempted to make them fun allies and adversaries for players and Game Masters alike. Each monster comes complete with updated statistics for the Pathfinder Roleplaying Game, lengthy ecologies explain how the monsters behave and why they are the way they are, tips on how Game Masters can use them in a campaign, notes on how to fit the monsters into the world of the Pathfinder campaign setting or your own home game, and more. Flumphs, everyone's favourite flying jellyfish monster, come from the stars to warn innocent civilizations of the cosmic horrors lurking in the darkness. Disenchanters, the blue-furred camels who live to prey on adventurer's magic gear.